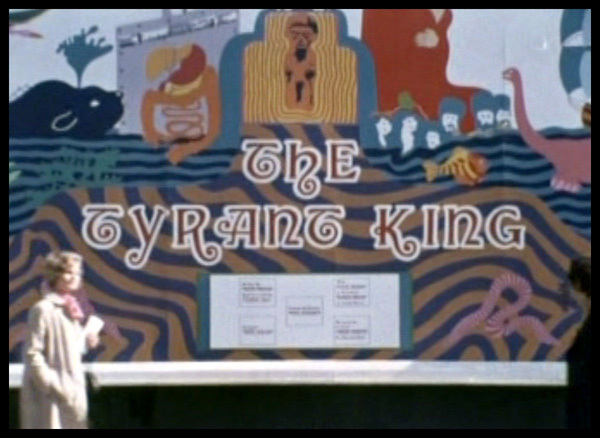 Three curious kids get into some surprisingly-trippy trouble in this early UK effort from director Mike Hodges (GET CARTER), who transforms a simplistic children's TV-tale into an off-kilter trek about late-1960s London and its environs. A six-part mystery-adventure (with a total length of 146 minutes), it boldly broke out of the usual videotaped, studio-bound Thames Television fare, and was instead shot in vibrant 16mm color around various London locations. 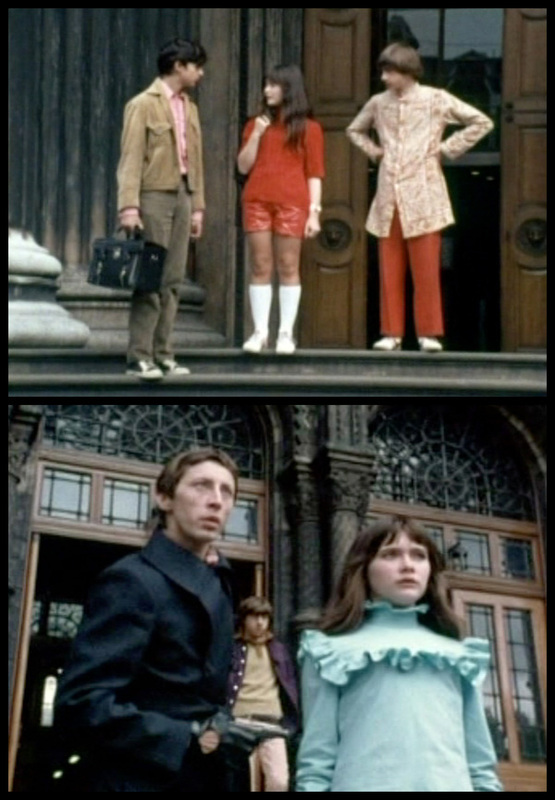 Based upon a rather ordinary children's book by Aylmer Hall (published by London Transport to help promote the city's public transportation system), Hodges and scriptwriter Trevor Preston (who later penned Hodges' I'LL SLEEP WHEN I'M DEAD, created the UK fantasy ACE OF WANDS and earlier adapted a 10-part, 1967 TV-version of THE LION, THE WITCH AND THE WARDROBE) create a paranoia-fueled travelogue overflowing with exotic production design, fab clothes and astounding music... 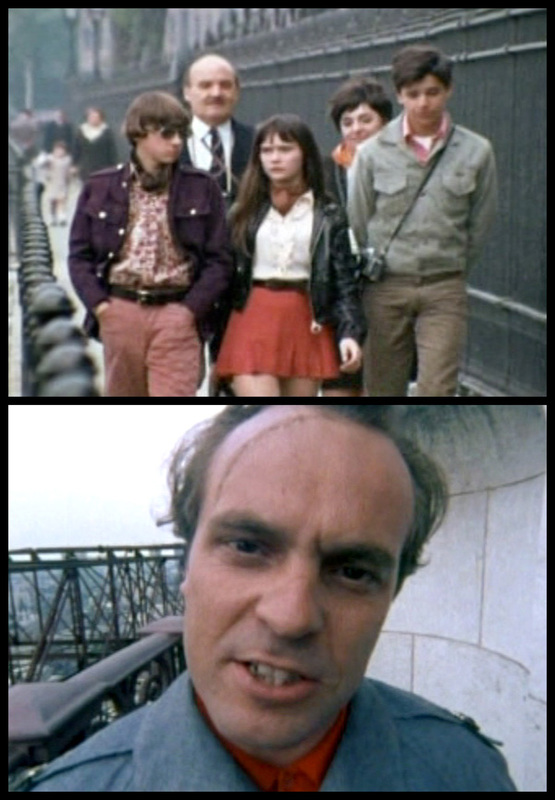 When a trio of bored young teens on summer break -- shutterbug Peter Thorne (Kim Fortune), Bill Hallen (Eddie McMurray, who had played Edmund in writer Preston's 10-part, 1967 TV-version of THE LION, THE WITCH AND THE WARDROBE) and younger sis Charlotte (Candy Glendenning) -- investigate a strange old mansion in their neighborhood, they end up privy to a sinister-sounding phone call that jumpstarts their search around Lon-don's tourist spots and landmarks to find an elusive "Tyrant King." Over several days, the trio visits St. Paul's Cathedral and its Whispering Gallery, the Imperial War Museum, the Hampton Court astronomical clock, Hyde Park, The British Museum in Kensington, and lots more, while finding additional clues within a puzzling illustration hidden in an old wallet. They're not alone in their quest though, and the friends spend much of the show attempting to ditch a suspicious creep (Philip Madoc) they nickname Scarface. As the kids take double decker buses, trains and subways about the region, there's a smattering of legitimate danger (Charlotte is chased about Kew Gardens by Scarface, Bill gets locked in a basement, Peter's severe claustrophobia kicks in when touring Chistlehurst Caves, Scarface poses as a market researcher to snoop inside the Hallen house) and extraneous detours (a circuitous walking tour led by Peter's dad, a drive to Greenwich's Cutty Sark clipper ship). No question, these three make lousy amateur detectives, with the viewer left just as clueless about where it's all heading or the meaning of this "Tyrant King." But after four episodes and few answers, Murray Melvin (THE DEVILS, BARRY LYNDON) enters in a pivotal role as prissy, villainous "Uncle Gerry," with everyone eventually converging on the National History Museum for some last-minute suspense and shoehorned, Scooby-Doo-style exposition... The basic story is ridiculously formulaic kids' stuff, but Hodges elevates and often subverts this material with his innovative cinematic eye. In addition to demonstrating just how handy public transportation can be in solving a mystery, Hodges tosses in wonderfully gratuitous nightmare sequences, montages, crash zooms, and offbeat props. Madoc exudes a sinister, Klaus-Kinski-esque vibe and the three young leads (plucked from the Italia Conti Stage School) are nicely naturalistic, while their cornea-singeing mod wardrobe includes Nehru-ish jackets and suede Beatle boots; salmon-leisure-suited Bill is a Peter Tork lookalike; and Charlotte sports groovy mini-skirts or hot pants combos. Best of all is its incredible soundtrack, with The Nice's "The Thoughts of Emerlist Davjack" opening each episode and Hodges peppering the show with snippets of Cream ("As You Said," "White Room," "Sunshine of Your Love"), The Rolling Stones ("She's a Rainbow"), The Moody Blues ("Dr. Livingstone, I Presume," "House of Four Doors"), and Pink Floyd ("Astronomy Domine," "Colonel Clegg," "Interstellar Overdrive"). That's reason alone to check it out.